I started playing guitar just like a million other guys, after The Beatles performed on The Ed Sullivan Show in the early 60s. The following year I began playing percussion in the school band program. I played in several different bands in high school. In 1973 I entered college as a music education major. I wanted to study music but I was also concerned about being able to sustain a reasonable living so I took the path to become a teacher. While doing graduate work as a music composition major I began collecting gear for a home studio. The studio became a way to realize my compositions. This is really when I started playing many of the parts. I was already a guitar player and a drummer. All I needed was a bass to complete the band...good old Tascam multitrack to the rescue. So for the past 30 years I have been teaching by day, recording by night and gigging on weekends. Its no wonder that I feel tired at times. My new CD is called One-Way Ticket. The concept of this album is a bit of a departure from my other CDs which were collections of songs. One-Way Ticket is the soundtrack to an imaginary movie about changes in life in which we have no choice. With a one-way ticket you are not returning home. You venture ahead with courage because you have no choice. Being a soundtrack, so to speak, I recorded all the tracks myself. Many of the tracks started as improvisations as I watched video clips and later were worked into pieces with tighter forms. One of the aspects of soundtracks that attracts me is the idea of creating music with a vision first as opposed to starting with a cool riff on the guitar. The main steel string acoustic that I record with is a Guild GF60 that is about 25 years old. This is an upscale model that Guild made in the 80s as they were trying to get Eric Clapton for an endorsement. I actually have a promo poster where Clapton is playing this model Guild. Unfortunately, at the last minute he decided to go with a Martin. The classical guitar that you hear is a Taylor NS32 SE. Both of these as with the other acoustic instruments were recorded in my studio with a Shure KSM 44 large diaphragm condenser mic. 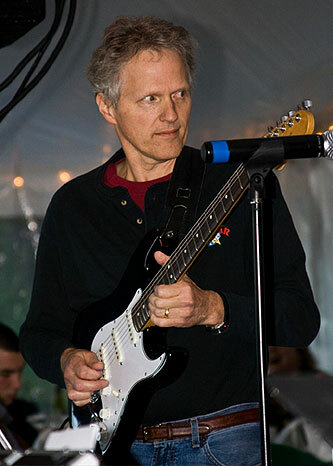 As for the electric guitars, I mainly use a Fender Strat and a Fender Telecaster. Both have ash bodies and maple necks which is a combination that I happen to like for the resonance. In most cases the guitars are recorded through either old tube Fender amps from the 60s or a Vox AC 15 Reissue. I also use an old Supro tube practice amp. I mic the speakers in a isolation box in my studio so I can turn them up and use the natural amp distortion without my neighbors knocking at my door with my ears ringing too much to know that they are trying to get my attention. As for drums, Im a believer of real acoustic drums. I have Gretsch set with mics set up in my studio. I did use orchestral samples for the very last piece of One-Way Ticket, which is a recap of an earlier theme, only orchestrated to sound like the end of the movie. I also recorded some guitars direct on track #3. So other than a few keyboard sweeteners, everything else is acoustics, amps and microphones...lots of fun, really. On the acoustic side Im a big Tony Rice fan. A lot of my music has also been influenced by Darol Anger with Mike Marshall. I admire Bela Fleck for taking contrasting styles and actually synthesizing a new music. Ive also been impacted by Jerry Douglas dobro playing. It has actually made me try playing dobro. One of my favorite CDs is Jerry Douglas, Russ Barenberg and Edgar Meyer called Hip Hop And Wobble. I also love Ry Cooders Music by Ry Cooder, which is a collection of movie soundtrack pieces. On the electric side I would have to name Robben Ford, Carl Verheyen and Eric Johnson as large influences. Guitar players are always discussing Eric Johnsons tone and I agree that he is a master of his sound but what is often overlooked is just what (what notes) he is playing. Eric, just like the other two people mentioned often improvise using very wide intervals. You hear both ends of the guitar and the middle at the same time. This has a huge effect on tone! Carl Verheyen has published quite a bit of instructional material on intervallic playing. This is something worth checking out. As for recording, Im always recording and piling up the pieces. The next CD will be primarily electric which is something I havent done since releasing Crossfire in the early 1990s. 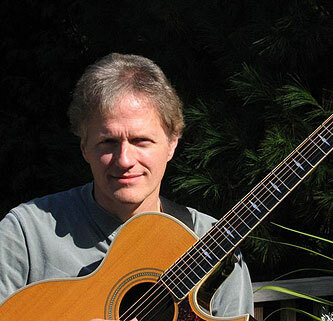 I released the acoustic CDs Green Flats Road in 2002 and Tracks in 2006. One-Way Ticket 2009 is a soundtrack, both acoustic and electric. Im really due to release more of a rocker. If my neighbors are reading this they should be worried. Im, as they say retiring from teaching school this year and plan to devote myself full time to performing and recording. 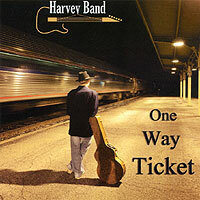 My web site is www.harveyband.com and my email is harvey@harveyband.com. There is a lot of music to listen on the site and often a free download of a song. I would appreciate hearing from people via email or my guest book. There is also a mailing list that people can join for gig and download announcements. Thank you so music for talking with me. It has been a true pleasure.